In the summer of 1945, the Pennsylvania Bedford Springs Hotel served as the detainment center for the Japanese ambassador to Berlin, along with his staff and all of their families. From this unusual real-life piece of history springs the historical fiction of The Bowl with Gold Seams, which follows young Hazel Shaw as she works at the hotel among the Japanese. Her experiences that summer shape her, and Hazel finds herself haunted by the memories for years to come. When she returns to the hotel many years after the end of the war, Hazel is suddenly and powerfully confronted with the past she thought she had left behind. A story about loyalty and loss, The Bowl with Gold Seams is a moving account of a formative experience in one young woman’s life. While Hazel is simultaneously dealing with a husband missing in action, she works among the families and staff being used as bargaining chips by the State Department to secure the release of American prisoners. The complicated relationships, emotions, and friendships that develop as a result of this tense situation affect Hazel’s life in unexpected ways, and Campbell deals gently but powerfully with the emotional consequences of that fateful summer. The distance of many years offers a powerful perspective that Campbell expertly capitalizes on. 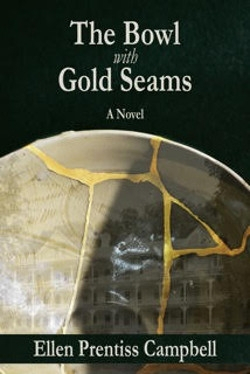 The Bowl with Gold Seams does not shy away from difficult topics, instead presenting a poignant and touching story of how what once was broken can be made beautiful.